Banish from your mind all thoughts of dank, dismal hostels — the Lisbon Destination Hostel, located in the architecturally stunning Rossio railway station, is light, bright, reasonably well-designed, and still affordable — a winning combination of comfort and style for budget travelers in the Portuguese capital. Sleeping choices range from ten-person dorms all the way to private rooms, all of which are equipped with clean, proper, comfortable beds (really!) and daily maid service. Use it as a crash pad, if you wish, but those looking for a social experience will find a fair number of opportunities — there’s a lounge equipped with free wi-fi and a billiards table, as well as a charming atrium garden complete with oversized cushions and hammocks for lounging. The multi-lingual staff are an invaluable resource for suggestions and recommendations, even if the tips are geared more towards tours and pub crawls than art auctions and private shopping appointments. You can recover from this return to you backpacking days with a complimentary breakfast, or cook up your own cure in the full-service kitchen. And if you’re in love with Lisbon already, and you’re really looking to extend your stay, there’s even a work-for-board volunteer program, with a five-week minimum commitment. Children under the age of 12 cannot be accommodated. Pets are not allowed at Lisbon Destination Hostel. Please contact CustomerService@TabletHotels.com for assistance. 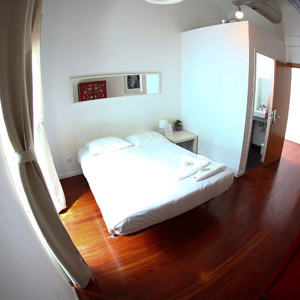 Room features 4 beds with private bathroom facilities. 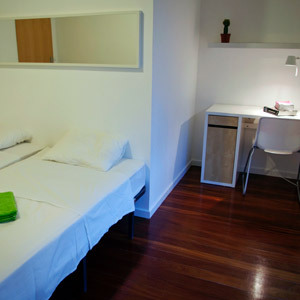 Room features 3 single beds with shared bathroom facilities.